I’m having a serious case of writer’s block right now, which is unfortunate because I’m supposed to be writing a review of a performance I saw last night and even though I enjoyed it, I’ve been staring at my computer for the past ten minutes wondering what the hell to say. The problem is that I haven’t been writing enough lately, and writing, like all crafts, must be practiced. I’ve been writing exams, and lectures, and emails to my students to let them know that they’re really not going to pass my course unless they actually complete their assignments… but not real writing. I do, however, have a fairly plausible excuse. My tap company, The Lady Hoofers, gave four performances last week, including three on Broad St. at The Wilma Theater and one at the Performance Garage as part of DanceUSA/Philadelphia’s Presenter’s Showcase. Having never taken part in a presenter’s showcase before, I’ve spent the better part of the past month not sleeping, freaking out about costumes, stressing about press kits and generally driving myself (and everyone around me) crazy. One evening, I dreamt that I forgot how to do a time step—a freakin’ time step!—and that we got kicked out of the showcase because we weren’t good enough. Fortunately, none of this came to pass. In fact, people loved us. And I only forgot one tiny little section of my own choreography (not bad when you consider the fact that I’ve got 17 different tap pieces in my head right now…). I’m now buried beneath emails and deadlines and costumes—so many freaking costumes!—but we had a great week and now that I’ve finally gotten a decent night’s sleep, I just might return to the world of the living and write that review. Here’s a photo from the Showcase. (Would you believe it, these dresses actually came from Burlington Coat Factory???) 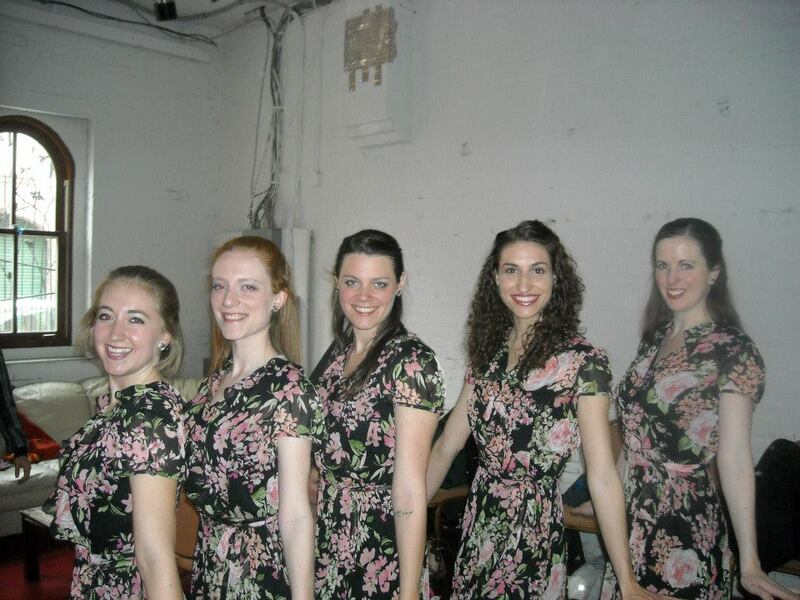 For more behinds-the-scenes photos, like The Lady Hoofers on Facebook! I do the same thing when it is time to write a book review. It’s like I know what I want to say, but I don’t know where to start. Same thing happened last week when I had my first major deadline as the Editorial Director. Much stress ensued, but it got done eventually. One thing that I’ve read a lot (nearly everyone who writes a ‘how to write’ book says this), just start by putting words on the paper. Even if your writing is terrible, it is better to have some terrible writing than no writing at all. Yes, getting started is usually half the battle (or more than half in my case…) Hope you met your deadline– I’m sure you did! Yup. Actually, it was kind of cool. I co-ghost wrote a book with two other people and we got the book written in 5 days. That’s got to be some kind of record. I’m so glad the only writing in my job consists of writing data analysis and emails explaining data. I love that your dance group is doing so many performances. But get back to writing, I have missed it. Все конечно красиво только обстановка – помещение не для фото. Но всеравно девченки прелесть. Живое фото без фотошопа – это отлично…..